Thanks for all of the sweet comments on the nursery preview yesterday…sorry to be a tease! 🙂 I can’t wait to show the rest off. It should be soon…we’re almost done! Total Weight Gain/Loss: I don’t know if the doctor’s scale is just off from mine, but I’m up about 15 pounds according to my home scale, as opposed to 19 pounds at the doctor’s office last week. I don’t know. 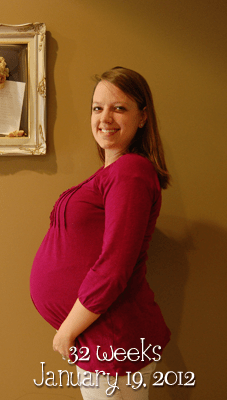 Maternity Clothes: All maternity…some of it isn’t fitting anymore as a matter of fact. The bigger stuff still works fine! Belly Button In/Out: Almost flat, and occasionally half of it will be an outie…it’s weird! Stretch Marks: None still, thank goodness! But the very faint “line” below the belly button is still there…not any darker though. Movement: She’s sort of slowed down this week. I don’t know if it’s because I’ve been sick or she’s just moving in the middle of the night when I’m asleep, but not as many jabs and kicks…a lot of rolling around though. Sleep: Terrible, but not because of pregnancy. I still have this miserable crud, and I can’t stop coughing! I have finally broken down and taken Tylenol PM the past couple of nights…I had to so I could at least get some sleep. It’s my best friend right now! What I miss: Well, once again not pregnancy related, but not coughing. It got real old, real quick. What I am looking forward to: Our showers start next weekend! Cravings/Aversions: Really not anything…sweets still. Symptoms: Still lots of Braxton Hicks, but the breathing has been MUCH better this week…maybe she’s starting to drop just a little? It might be too early, but I’ve noticed a big difference. And the mood swings, y’all…say a prayer for my husband. It doesn’t take much to set me off these days. Best Moment This Week: Hmm…it hasn’t been a very eventful week honestly. I did love having Monday off to get lots of things ready though!